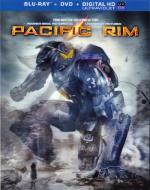 When legions of monstrous alien creatures, known as Kaiju, started rising from the sea, a deadly war began. To combat them, humans devised massive robots called Jaegers as weapons. Controlled simultaneously by two pilots, even the Jaegers proved nearly defenseless against the Kaiju. Now on the verge of defeat, mankind must turn to a washed-up former pilot and an untested trainee teamed in a seemingly obsolete Jaeger. These unlikely heroes are the last hope against a mounting apocalypse. This is a really fun, action packed film. I liked the cast and characters that they portrayed. If I have any complaint it is that maybe it lasted a little too long. It felt like to me it had a perfect ending spot then kept on going. 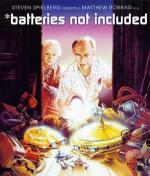 *Batteries Not Included is a delightful fantasy for the whole family presented by Steven Spielberg. When an unscrupulous real estate developer sends thugs to get rid of the last five tenants of a deteriorating apartment building, they need a miracle to save their building from demolition. One night, when all hope seems lost, tiny visitors from outer space mysteriously glide through their windows and begin to turn the tide with their magical powers. Filled with dazzling special effects, this amazing story of intergalactic warmth stars the acclaimed husband-and-wife team of Hume Cronyn and Jessica Tandy as a pair of feisty long-term tenants whose faith is rewarded in ways they never expected. This is the first time I have seen this film... and I enjoyed this one quite a bit. It offered a good cast and a story line with a few good laughs in it. This one is definitely worth the time put in to watch it.